BOARDMAN, Ohio — On a Friday afternoon at Three Sheep Gallery and Workshop, nine women sit around a large, wooden table sipping tea, eating cookies and working on knitting projects. It’s pretty much just as Linda Shevel imagined it when she opened the shop in 2016. “I never really thought I’d have a store. I just liked to make things,” Shevel said. Shevel has knitted since the 1970s and sewed her own clothes since she was a teenager, she said. When she and her family moved to the area from Pittsburgh 10 years ago, she realized there were a number of talented ladies in and around the Mahoning Valley and she was looking for some friends to craft with, she said. After Shevel started a knitting group at her church, her husband, David suggested she open a shop where she and her group could get together, knit and sell the things they make. They renovated the former Amer’s Hobby Shop at 6010 Market Street and created Three Sheep, where artisans can make and sell their handmade items. Products for sale include knitted and crocheted items as well as jewelry, soap, body balm, sculpture and honey. All products are handmade by local artisans. Classes are available as well. Deborah Tolich of Mineral Ridge started coming to Three Sheep a few years ago and said the concept resonated with her. She has been taking a polymer clay class. Creating that space was important to Shevel, who said knitting is “rewarding and therapeutic,” especially when knitting in a group of supportive women. As Valentine’s Day is approaching, artisans are bringing special handmade items for the holiday, including baked goods from Christine Harley and natural dog treats from Kiss Bitts Pet Bakery. “I have customers that keep coming back for more because their dogs enjoy them,” Shevel said. Husbands can get in on the action too, she said, and some have come in to spin yarn or knit. Last year, some husbands attended a special class for Valentine’s Day and “the wives loved that their husbands took to the time to come and make a gift for them,” she said. Shevel is in the process of getting a license for Saori weaving, which is a weaving method of “free weaving and free expression,” she said, that was founded in 1969 by a Misao Jo of Japan, who died last year. Reporter Nami Nagaoka tries her hand at Saori weaving. 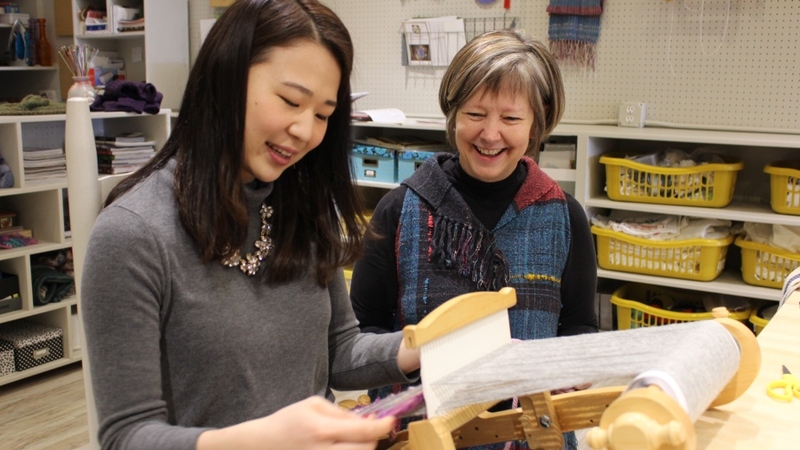 Shevel was introduced to Saori weaving two years ago at a craft show and was drawn to “how you can share a room with other people and how you weave in a community,” which seemed fit to her concept of bringing women together, she said. Pictured above: Linda Shevel and her Friday knitting group at Three Sheep at 6010 Market Street.